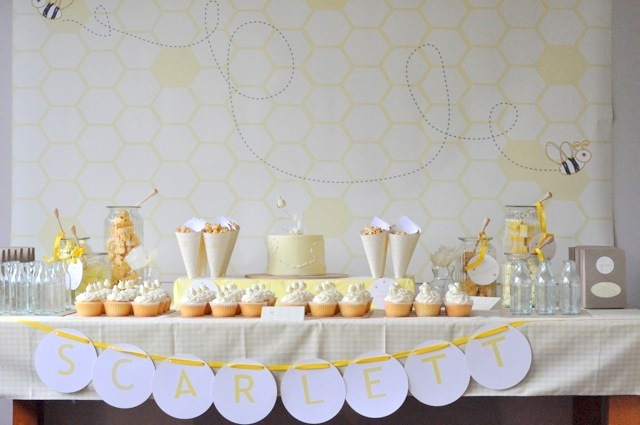 How cute are the yellow and white paper lanterns and paper poms? 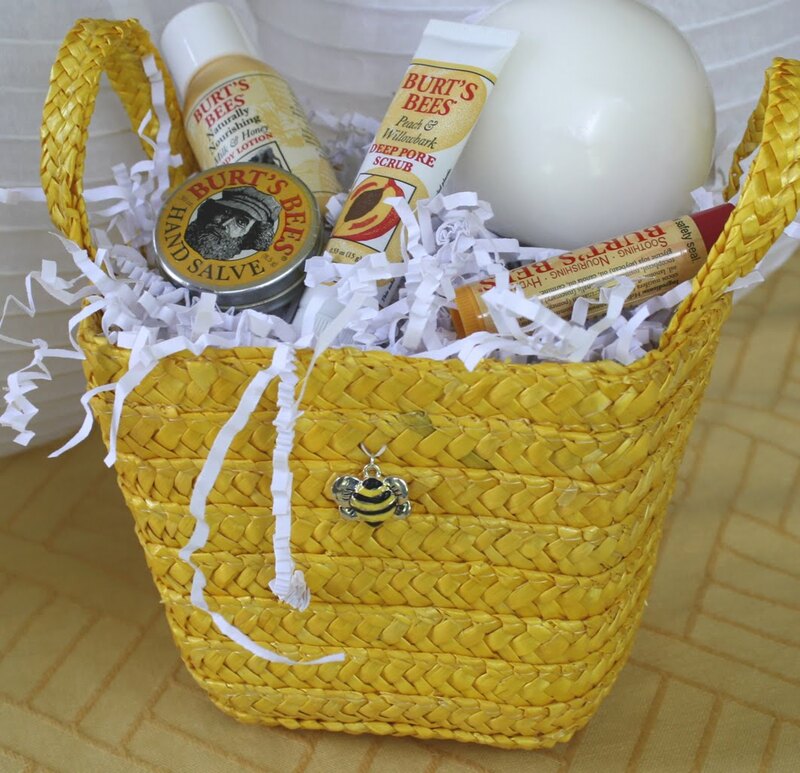 It really creates the effect of buzzing bee hives! 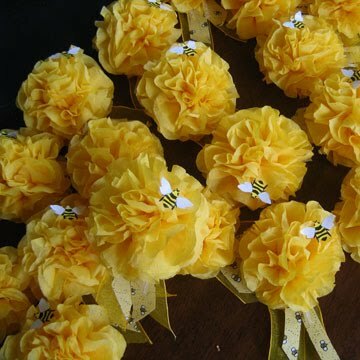 Tissue paper corsages for each of the party guests! 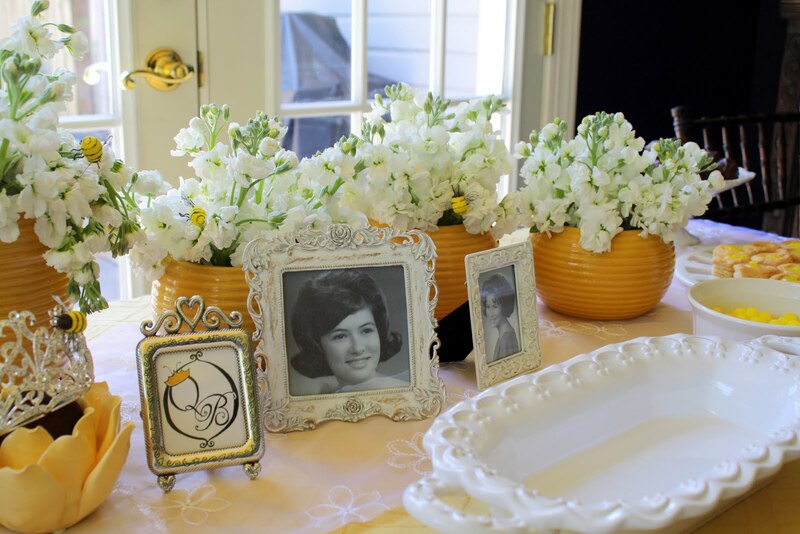 Love the yellow "honey pot" flower pots and fresh, white flowers! Daisies would be beautiful too. I'm particularly fond of the combination of yellow and white, rather than yellow and black, which keeps the details warm and sunny. 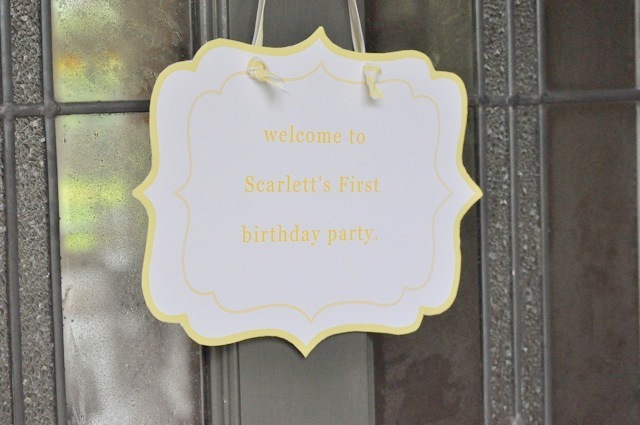 And how about the custom details of this first birthday party featured on Imprintables? 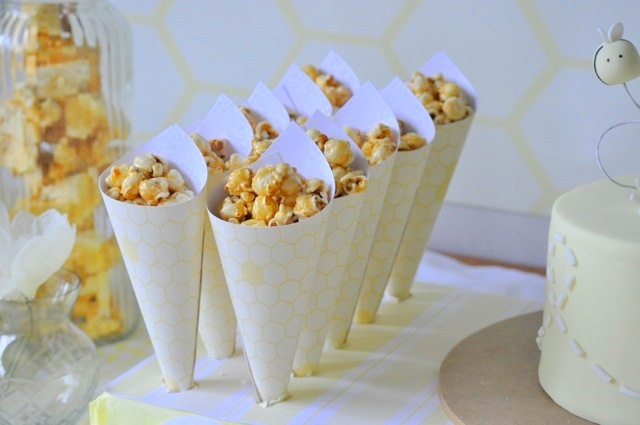 It wouldn't be a tribute to the bee without a few honey-infused sweets, like this honey popcorn in paper cones! 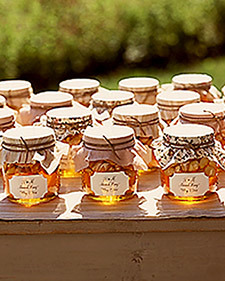 An obvious, but fool-proof favor idea would be jars of honey. These cupcakes are absolutely amazing! They're topped with hexagonal "honeycomb" sugar cookies, filled with honey in the center, and complete with candy "bees"! 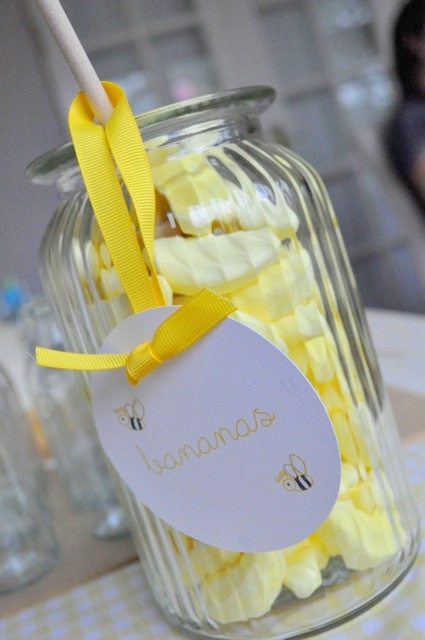 Of course, this theme could easily be adapted for a baby shower or even a bridal shower! 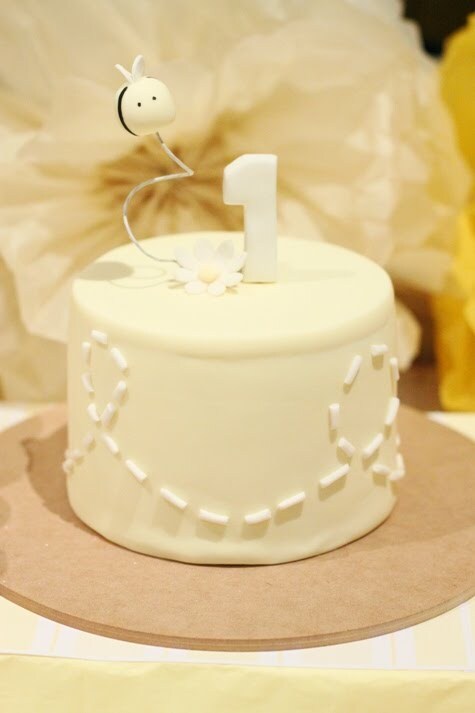 For just such an example, just check out this chic B is for Baby Shower featured on Hostess with the Mostess! That's great! I love bees! Those honeycomb cupcakes are incredible! Such a creative idea! Thanks so much for featuring my party! The link to my blog post is broken. I think there is an extra http// in there. Thanks for pointing that out, Melissa. It should be fixed now. ;) Thanks so much for letting me feature it! I finally have the paper carnation corsage tutorial on my site! That is a great idea!! I really loved it. Thanks for sharing party inspiration dear. Well, we are planning to throw a grand surprise party after wedding of our boss. We just saw a couple of wedding venues Los Angeles and would like to book one of those venues for this party. I was already designing movie-themed tablescapes for my family's annual Academy Award dinner parties as a preteen, and still feel like a kid in a candy shop whenever I walk into a craft or party supply store. I have a daily urge to create and I love to channel that through event-planning. Look around, comment, or contact me, and get ready to party!